Michael Craig-Martin studied fine art at Yale University returning to Europe in the mid-1960s and becoming one of the key figures in the first generation of British conceptual artists. He was a professor at Goldsmith's College from 1974–88 and 1994–2000, where he remained a powerful influence on the emerging British artists. His early work made deliberate reference to the American artists he most admired, such as Donald Judd, Jasper Johns and Robert Morris. Although he was particularly affected by Minimalism and used ordinary household materials in his sculptures, playing against the logic of his sources. In the early 1970s, he exhibited his now seminal piece An Oak Tree, consisting of a glass of water standing on a shelf attached to the gallery wall. In the accompanying text, he asked himself questions to assert that the glass was in fact an oak tree. Craig-Martin continued working in various forms, always maintaining an elegant restraint and conceptual clarity. During the 1990s the focus of his work shifted decisively to painting, with the same range of boldly outlined motifs and luridly vivid color schemes in unexpected (and at times apparently arbitrary) combinations applied both to works on canvas, and to increasingly complex installations of wall paintings. 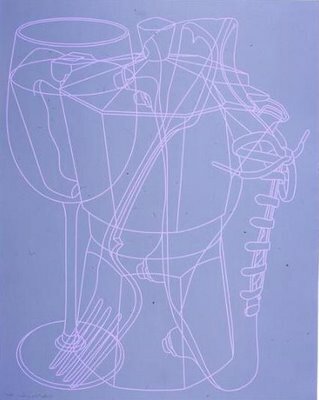 Michael Craig-Martin studied fine art at Yale University returning to Europe in the mid-1960s and becoming one of the key figures in the first generation of British conceptual artists. He was a professor at Goldsmith’s College from 1974–88 and 1994–2000, where he remained a powerful influence on the emerging British artists. His early work made deliberate reference to the American artists he most admired, such as Donald Judd, Jasper Johns and Robert Morris. Although he was particularly affected by Minimalism and used ordinary household materials in his sculptures, playing against the logic of his sources. In the early 1970s, he exhibited his now seminal piece An Oak Tree, consisting of a glass of water standing on a shelf attached to the gallery wall. In the accompanying text, he asked himself questions to assert that the glass was in fact an oak tree. Craig-Martin continued working in various forms, always maintaining an elegant restraint and conceptual clarity. During the 1990s the focus of his work shifted decisively to painting, with the same range of boldly outlined motifs and luridly vivid color schemes in unexpected (and at times apparently arbitrary) combinations applied both to works on canvas, and to increasingly complex installations of wall paintings.